At Holt Broadcast we specialise in the manufacture and production of high quality precision sheet metal products and services. 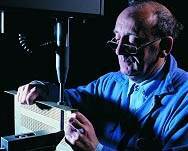 We offer a fully customised service, with an expertise in the fabrication of custom panels and 19" rack mounting cases. These services are complimented by our range of standard products described further below. Since the formation of the company in 1994, we have always believed in working in partnership with our customers, from the initial design phase through to the manufacture of the finished product, offering flexibility, quality and value. Our customers range from individuals to large organisations, from those who use our services and products to build their own products, to sub contract assemblers and systems integrators, to catalogue based resellers. 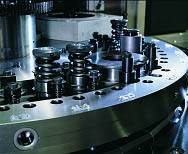 They also come from an ever expanding range of industrial backgrounds including Broadcast, Electronics, Telecommunications and Instrumentation manufacturers. As part of our custom metalwork solutions, we offer a complete end to end process from design consultancy and one off prototyping, to preproduction and batch runs, including full finishing services. Quality and flexibility are central to the service we offer our customers, no matter how large or small the job. We can base projects on a customer's specific design, our own in-house standard products, or even just a telephone conversation. Holt Broadcasting Services design and manufacture a wide range of quality standard products some of which were originally designed by ourselves in order to complement the 19” based installations and associated equipment. If by any chance you need a different size, colour or other variation please get in touch. We manufacture and supply a range of 19” blank panels in two basic styles, being flat and extruded. Our range of extruded panels are well suited where a more robust and rigid structure is required. All panels from Holt Broadcasting Services can also be customised to meet your exact requirements. The joggle cases we manufacture are very robust and sturdy and built with an extended bottom cover that includes a joggle for the two halves to fit together and form a solid structure. These panels too can be modified to suit your particular needs so please feel free to contact us. 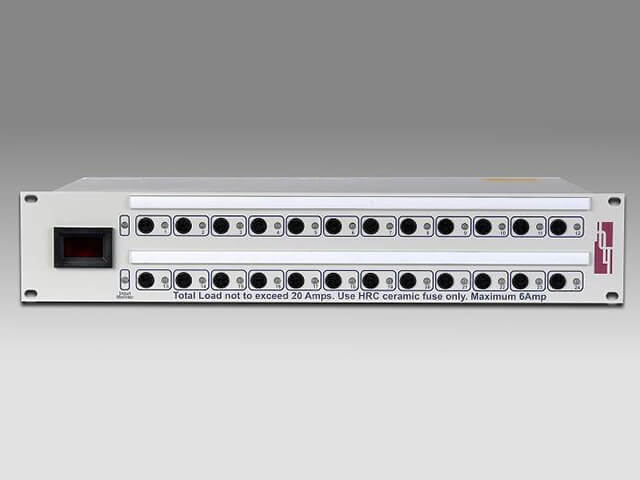 Holt Broadcasting Services produce a range of 1RU and 2RU 19” rack mount units designed to provide mains power distribution in consoles and equipment bays all of which are available as 12 or 14 way (2RU) with single or dual inputs. All have undergone full in house testing and external testing including EMC and safety tests and all units are RoHS and WEEE regulation compliant. 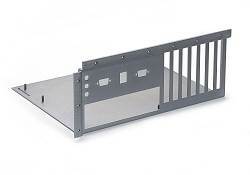 These quality rack mounted keyboard trays are ideal for when space is at a premium and where there is no requirement for separating monitors and keyboards. They feature a space efficient and slim 1U design and supplied with low profile Cherry 1400 keyboard. Additionally no tools are required for the removal of the keyboard. Holt Broadcasting Services manufacture both `U` and `L` section pre-punched rack strips as one of our standard products. Our `U` sections are available in 22U lengths while the `L` sections come in 45U lengths, both rack strip formats are made from Zintec. For more information please visit our website. 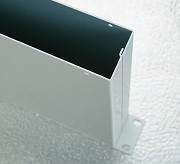 Our rack supports are extremely easy to install when used with the matching rack strip. You simply adjust to the appropriate depth, clip in the front and rear then tighten the depth adjustment locking screws. These too are manufactured from steel with a zinc and colour passivate finish. The RU Tie Bar Panel from Holt Broadcasting Services have been specifically created for use on studio wall boxes and provide a convenient way of giving strain relief for studio floor cables. For more information on our 1 RU Tie Bar Panels please take a look around our website which provides a range of PDF data sheet downloads. The 1 RU Brush Strip Panel allows cables to be brought out of the front of a desk in order to cover up so called unsightly apertures. They feature easy to use cable access points, brush for cable protection and cutaway construction. They can also be used with the brush sides facing each other to provide more access for larger cables. The Anker brackets have arrived, spot on – thank you, they are perfect. Hello Carrie, This is somewhat old news, but I received the package and it is just as I needed it to be. Just wanted to thank you personally for being patient and providing me a great service. Thanks and best wishes. Thank you to Team Holt for such a quick delivery and great service! The package was received safely yesterday, thank you. The work is excellent, the folding is the most accurate I've had yet from any supplier. You've used a lighter material which is more appropriate for this sort of device. Great turnaround time too. Very pleased. First of all I wanted to say thank you for the chassis you manufactured for us on our PO using your sheet metalwork and our machined side panels. We received these on Wednesday and we are very pleased with results. All the parts married up perfectly and we were impressed to find you had assembled them all up into complete units to check the fit. It is this level of care and the overall quality of finish which makes us return to Holt Broadcast, although we give you a strange mixture of jobs at times! :-) A big thank you to everyone. Just to let you know the plates were absolutely perfect - the engineers are singing their praises. Just a quick note to thank you for squeezing my job in last week – delivery yesterday saved the day, and is most appreciated. I’d be grateful if you could relay my gratitude to the drawing office and production staff. Thanks again and best wishes – John. Lovely looking enclosures, really impressed. A special thank you for delivering those plates well ahead of the promised delivery date. Great quality and service as usual.